Horizontal vs Vertical Air Flow System in a Dehydrator-Which One is Best? Now, you must be thinking that if both of them lead to the dehydration of the food impeccably, then what is the difference between these Horizontal and vertical air flow? ​Well, There are a lot of differences between the vertical air flow system and horizontal airflow system food dehydrator which make them dissimilar to each other. 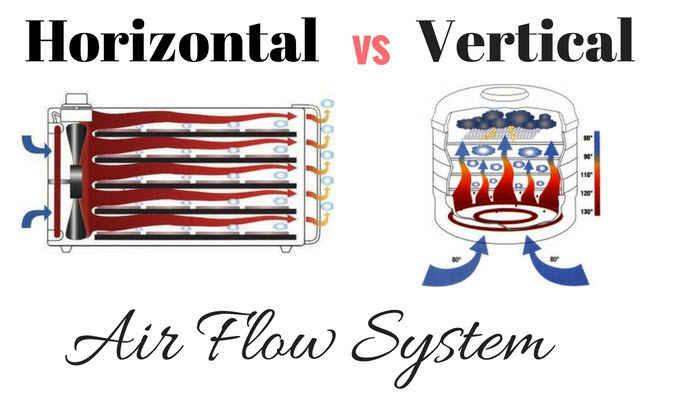 ​What's exact meaning of Vertical Air flow and Horizontal Air flow? ​Vertical air flow and horizontal air flow are the two ways through which the air moves in the food dehydrator for drying out the various food items. ​“Vertical air flow” refers to the condition in which the air moves from the bottom towards the top direction and vice versa in the food dehydrator. ​Meanwhile, the “horizontal air flow” refers to the condition in which the air moves from the back side of the food dehydrator to the front side. Does diverse drying system lead to the efficiency inversely? 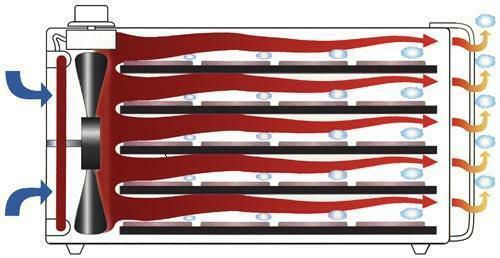 ​Of course, the diverse dehydration system of the air flow leads to the efficiency inversely. The vertical air flow system and the horizontal air flow system have the different effect on the food which you want to dry out in the food dehydrator in terms of quality and effectiveness. ​In order to make you clearer, let’s give you an example. 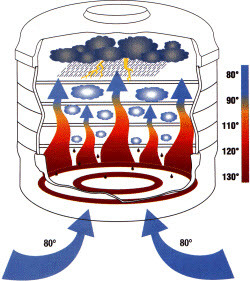 For instance, if you dehydrate same quantity of food for the similar time in the food dehydrators having different air flow systems, then the food dry out in the vertical air flow system will look much greater than the horizontal air flow system because in the horizontal system the food gets over dried sometimes. ​In the vertical air flow dehydrator, usually the fan is located on the bottom most area of the appliance. Such dehydrator devises up and down direction of air along with the heated base that is fixed to the bottom-most region of the machine. ​For instance, the Waring Pro DHR30 and the Presto 06300 are the best examples for the vertical flow food dehydrator which possesses up and down the flow of air system. ​These type of food dehydrators which have vertical air flow system is more reasonable than those the horizontal air flow food dehydrators. You can use them for drying out the subtle items such as strawberries, herbs, peaches and much more. These types of food dehydrators are more pocket-friendly to buy. You can dry out the delicate things like herbs in this perfectly. Offers an excellent result in the end. Usually, these types of appliances are smaller in size. Uneven distribution of heat since the fan is mounted at the bottom side. Not suitable for the food items like meat and chicken which requires more heat. ​The horizontal air flow food dehydrator provides uniform distribution of heat over each tray and also the fan is located in the back section of the appliance. The air flows from back to front side by maintaining a stable temperature over all the trays. In this system, lots of heat is produced in very quick manner. ​For instance, the Nesco Gardenmaste﻿﻿r and the Excalibur 3926 TB Food Dehydrator are the best two examples for the horizontal air flow system food dehydrator. Both of them are stackable models. ​These appliances work best for the people who have the shortage of time or have a very hectic schedule. The horizontal air flow food dehydrator are top suitable for drying the food items like meat, chicken, jerky, etc which requires more heat. ​Are you looking for a budget-friendly appliance? Then this might not be the best option for you since these are quite expensive than the vertical flow food dehydrator in terms of price. It offers uniform distribution of heat over all the trays. Perfect choice for dehydrating the hard food items like chicken, meat which requires the large quantity of heat. Best suitable for the people who have a hectic schedule for the day. Fruit leather rolls, as well as the steamed walnut leaves, can also be prepared in such appliances. You can use it for drying out the large quantity and the numerous varieties of foods at one single point of time. Faster dehydration than the vertical air flow system food dehydrator which saves lots of time. Such appliances are more expensive than the vertical air flow food dehydrators. Usually, these food dehydrators are bigger in size. In the end, we can say that the selection among the vertical flow food dehydrator and horizontal flow food dehydrator is completely depended on your personal requirements. These multipurpose appliances obligate a comprehensive variety of uses i.e. conserving the herbs to preserving the vegetables and fruits. ​Once you get assure that which type of system you require in the food dehydrator, then the next thing that you have to do is to select the appropriate model which possesses that air flow system.